I have been an infrequent visitor to The Aspire Clinic for about 7 years. 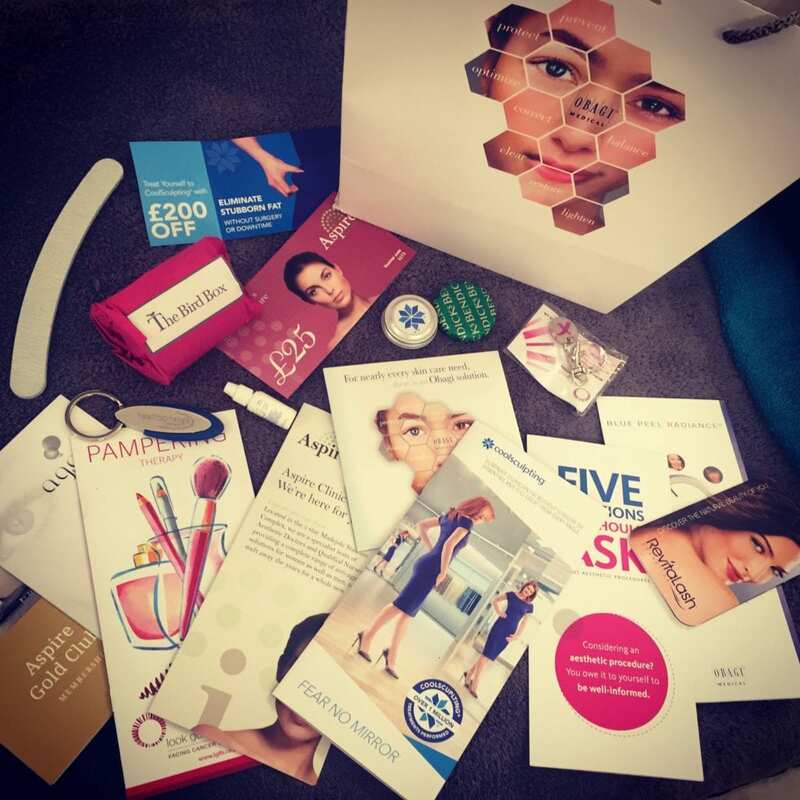 Like all of us, I have been swayed by online offers by more local clinics or dental surgeries and have even travelled further afield to get the odd £50 off Botox, only to be disappointed with not only the treatment but the customer service too. Being told you need your temples filled with a mixture of your blood and some coagulant, when you all you came in for was 2 areas of Botox. It wasn’t quite the customer relation I was hoping for. However, when I have visited Aspire I have always felt well looked after and reassured. I know that their clinic is as clean as can be, and the products they use are of the highest quality. Their aestheticians and members of staff are of the highest calibre, they know their stuff. And most importantly, I feel welcome and cared for. Before my 2 week family holiday I popped into The Aspire Clinic for my usual Botox treatment. I’m 34 and have been having Botox every 4-5 months for a few years now, but inevitably interrupted by pregnancy and my busy lifestyle. I’m often greeted with gasps of denial from clients and friends, “Surely you don’t need Botox!” I’m a stylist, I’m not just customer facing, but model and mirror facing too! Try looking at your reflection for 8 hours a day, you’ll start picking holes too. For me, Botox works really well, not only banishing the wrinkles, but making me feel more confident about my looks. I look like this because I have the Botox treatments. Instantly, I feel relaxed and comfortable in the dandelion room, but couldn’t help noticing the new piece of equipment next to the bed. There had been some advertising in the lift on the way up to the clinic, for a new non invasive fat eliminating treatment. Sure enough this was it. CoolSculpting had arrived at Aspire. I was in a rush so I grabbed a leaflet and over a brew at home, I studied the information. It sounded amazing, I had to know more. So when a glamorous looking invitation to “A special event from Aspire” popped into my inbox, I knew I had to secure my place (and that of 2 of my buddies). 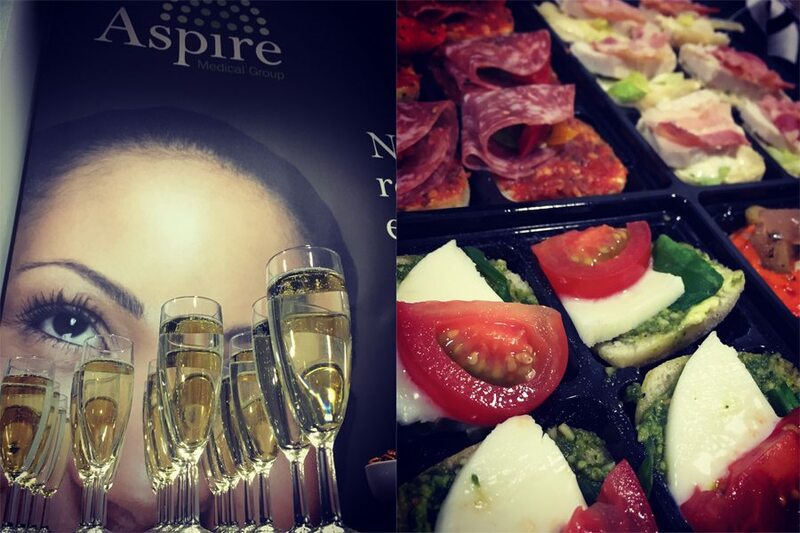 Aspire’s 1st open evening kicked off with champagne, elderflower fizz and canapés served in the Directors lounge of the 5* Madejski Stadium. Home of Reading FC, and just one flight of stairs below the clinic itself. There was an impressive view looking out to the empty stadium from folding doors, which as a footie fan was very cool, whilst taking advantage of the gorgeous refreshments. A gathering of 30 formed and we were welcomed to the clinic open evening by Jenny O’Neill, Clinic Director. 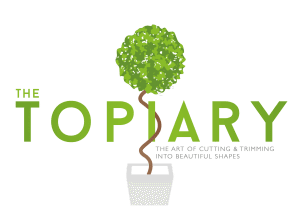 Jenny comes from a extensive Harley Street background and her aspiration for her clinic is that of providing a professional Harley Street experience. Quality procedures with great, personable customer service. The objective of the evening is for us to look behind the scenes at the clinic and to learn more about the services they offer, also the low down on their Gold club memberships. But of course I’m here for the main event, the CoolSculpting live demonstration. We collect excitedly around a prepped model ready to see how it works. The CoolSculpting procedure is the world’s number 1 non-invasive fat-reduction procedure. 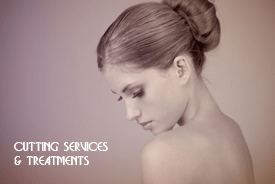 It’s an innovative way to contour your body by freezing unwanted fat away with no surgery or downtime. Sounds bonkers right? But it’s seriously exciting stuff. The CoolSculpting procedure can help both women and men get rid of those stubborn bulges for good. Scientists at Harvard University observed that some children who ate ice lollies got dimples in their cheeks. The popsicles were freezing and eliminating small pockets of fat cells. 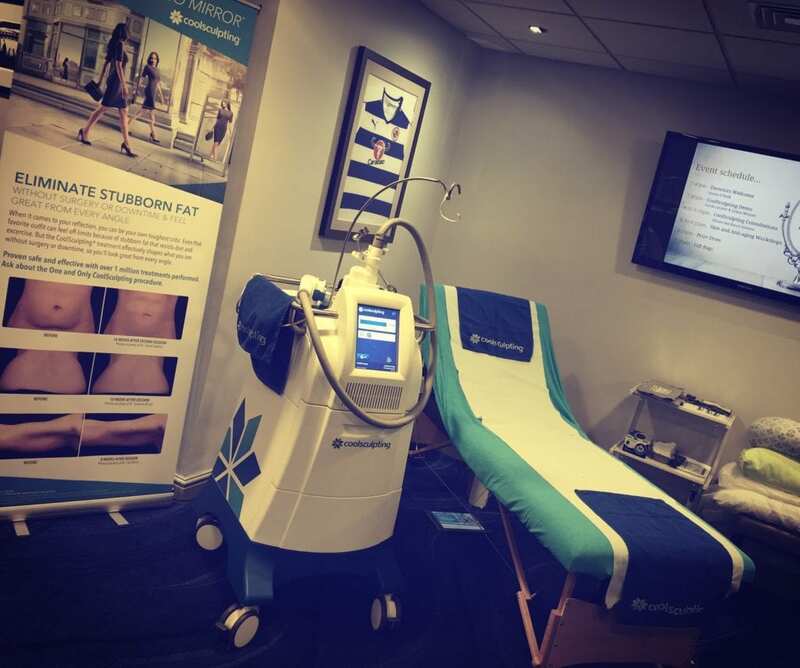 The realisation that cold can target fat cells—without damaging the skin or surrounding tissue—was the insight behind Cryolipolysis®, the proven science on which the CoolSculpting procedure is based. The machine’s applicator is applied expertly by Sarah on to the model’s abdomen and some button pressing later, it’s working it’s magic. The lady has two fatty pouches on her tummy area, which she is unhappy about. And no amout of dieting and gym visits can shift the overhang. She had one side treated two weeks ago, and has now returned to treat the other side. Within 2 minutes she is covered over with a warm blanket and handed her iPad to relax during the treatment, which takes around 30 mins. It works on those love handles, fatty knees, double chins, stubborn excess fat on thighs, auxiliary puffs (the fatty bulge in front of your armpit) and back fat. The procedure safely delivers precisely controlled cooling which gently and effectively targets the fat cells underneath the skin. These treated fat cells are crystallised, then die. Fat cells that are frozen during the CoolSculpting procedure will gradually die off and leave the body through the body’s natural elimination process. The results are long-term. The fat is gone for good! The treatment is the only FDA approved fat freezing, non surgical, non invasive procedure with a 95% patient satisfaction. At this point my ears pricked. The all important FDA approval. It’s super safe and it really works. Whilst the impressive machine counted down the 30 minute procedure, a smattering of questions immediately followed and murmurings of approval could be heard after each response. Jenny then went on to inform us of the many treatments that are available from the clinic including Botox and Dermal Fillers, Thread lift, Agera face peels, Dermaroller, and PRP aka the Vampire Facial to list but a few. We are introduced to the Gold Club, a membership scheme which not only gives fantastic saving and discounts but let’s you spread the cost throughout the year, definitely doing that! Also, we were brought to the attention of their chosen charity, “Look Good, Feel Better” providing practical support for women struggling with the side effects from cancer treatment. I’m invited to go for a consultation upstairs to the clinic and I’m raring to go. A private one on one with Sarah reveals I’m a good candidate for CoolSculpting on the areas that bug me the most, I’m not shy in admitting, my back fat and my auxiliary puffs. I have seen a really beautiful dress that I would love to wear on our Christmas works do, but to be honest, those areas let it down. How many times have I stood in front of the mirror and prodded those little side fatty bits pouring out my bra? Too many. This would be the ultimate “Little black dress prep” and the results would last for years to come too. In my opinion this service would be especially amazing for brides-to-be who are worried about those areas that they think don’t look quite right in the dress, and men and women who have worked hard to shift some weight, but are struggling to lose that last bulge in hard to shift areas. The fat doesn’t replenish itself, so as long as you don’t go crazy and keep within your usual dietary habits, you’ll keep the fat at bay. Forever. My chums and I leave the clinic, goodie bags in hand, all of us are super excited about this very special treatment. 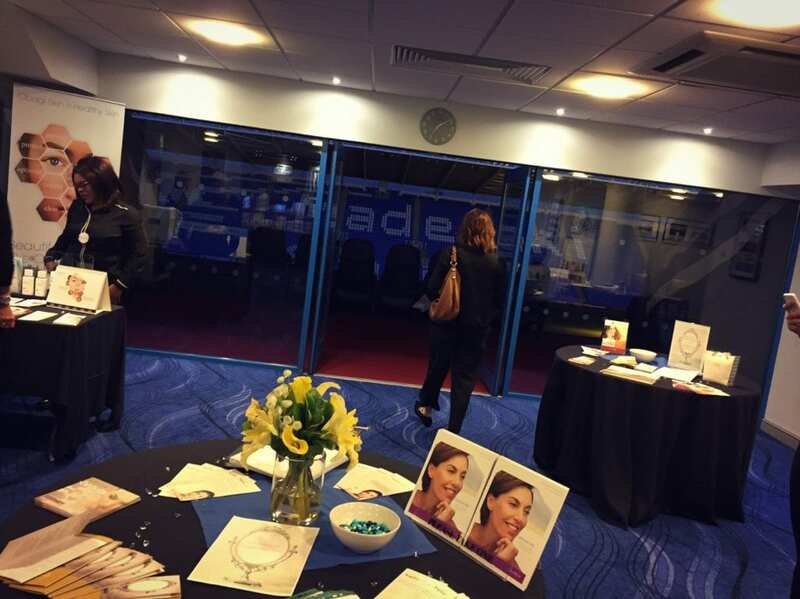 If you’re interested in CoolSculpting or any of the other treatments available from Aspire and want to know more, then head over to their brilliant new website www.aspireclinic.com Check out before and after pictures from CoolSculpting www.coolsculpting.com or call the Aspire Clinic direct on 0118 931 3575. They’ll be more than happy to arrange a consultation, appointment or just to give you some more information. So. Am I going to get Sculpted? Watch this space!